You’ve heard of “outsourcing,” right? But do you know what that word really means? A quick online search reveals the definition: to obtain from an outside supplier, especially in place of an internal source. There are all kinds of things that it’s great to outsource: laundry, getting your nails done, or any other kind of good/service that makes your life feel easier and more expansive. In fact, outsourcing can be a crucial part of self-care. But there are also times when outsourcing doesn’t feel good, like when we’re outsourcing our power. When we’re allowing the external reflections in our lives to dictate how we’re feeling rather than being grounded and centered in the truth of our own enoughness. When we’re seeking something outside ourselves in place of an internal source. For years, I went through the motions, checking all my self-care rituals off the list each day because it felt like that’s what I needed to do to measure up. And yet, I was far more driven by the external validation I received from doing these things than by a deep connection with myself or genuine desire to care for my body. I thrived on positive feedback and felt crushed by any criticism. 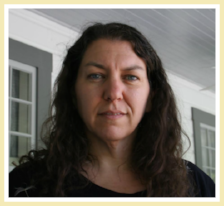 When I began working with Rebekah 3 ½ years ago, she was in a similar place. Her day-to-day energy level was determined by the amount of positive reinforcement she was receiving from external sources, and anytime she didn’t receive that loving feedback, her life was completely thrown off balance. 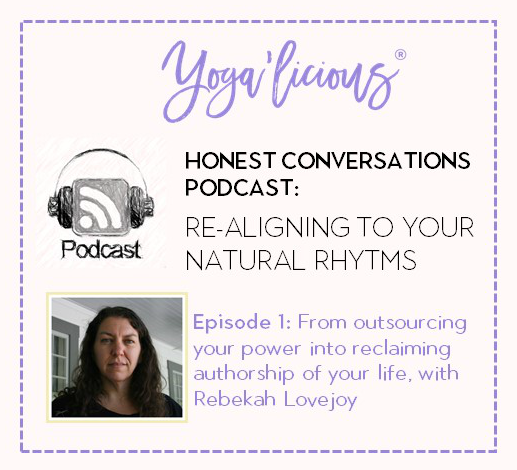 In this conversation, Rebekah shares with us how she came to recognize she was outsourcing her power and what steps she took to begin taking that power back and re-aligning with her natural rhythms and essential expression. I know you’re going to be nourished, enlivened, and impassioned as Rebekah shares some of the most potent moments of her journey with us, and I invite you to create some sacred space for yourself–draw a bath, grab a cup of tea, or cuddle up on your living room sofa–to enjoy this intimate conversation in the first episode of this special podcast series,Yoga’licious Honest Conversations Podcast: Re-aligning to your Natural Rhythms. Rebekah’s journey–how she recognized she was outsourcing her power, how she began creating new practices of self-kindness and allowing her internal voice to guide her on her path. 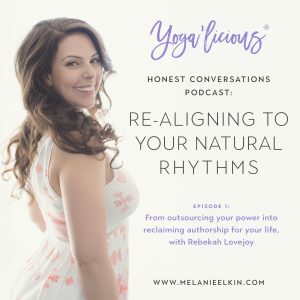 How the symptoms of disconnect–for Rebekah, exhaustion, insomnia, and making choices that are out of alignment with her true desires–are an indication that you need to re-align with the natural rhythm of your body. The importance of self-kindness and how to begin creating new habits of kindness toward self in your life. How allowing space for the discomfort to exist–in our lives and in our yoga practices–can open up beautiful new spaces for us to lean into and experience real growth. The importance of embodiment–getting out of our heads and into our bodies–on the path to sacred transformation. Rebekah’s story is such a beautiful reminder that awareness, self-love, and kindness are essential anchors for the choices we make and the actions we take as we begin unwinding old patterns. It’s been my deepest pleasure to support her on her path, and I’m so honored to share this conversation with you. As I shared in my previous email, this podcast series honors the opening of my brand-new incarnation of the Yoga’licious 6-Month Group Program: Re-aligning with Your Natural Rhythms and Essential Expression. Our journey begins October 2017, live in Santa Barbara, and it would be such a joy to receive you. To support you in taking the next steps toward what you want in your life. I created this program from the depths of my being. On the journey, I’ll share the deep heart-soul-learning-discoveries that have fueled the transformation in my own life and in the lives of my clients. This offering is designed to meet you at all levels: essential self-care, sisterhood, mentorship, yoga, meditation, mantra, ritual, re-aligning to the cycles and rhythms, coaching, and practices to support you in creating a new story around your body and expression. You skip that practice, and then the next one, and before long, it snowballs. A day, a week or more, beating up on yourself. You slip back into old patterns of self-criticism and self-doubt, mistrusting your body and your intuition. It’s time to call in the support you deserve–not because you “earned it” –but because you choose it. There’s something so immensely powerful about having someone awesome (me!) who has been where you are. Someone who really sees you, and who can hold that space for you to shine a loving light on those areas where you’re keeping yourself small. Someone who can help you play big. And there’s something deeply transformative about being part of a sisterhood where you can truly be yourself. Are you willing to make a stand for yourself and claim your space? 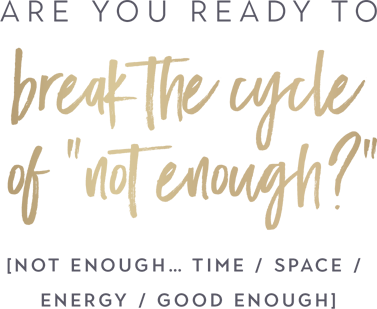 If any part of you is feeling a YES right now as you read about this sacred six-month journey, I invite you to get in touch with me right away (click HERE) to claim your spot for your complimentary no-strings attached call. This call is an opportunity: for you to be seen and heard; for us to intimately connect and feel into where you are right now, exploring what kind of support you’re most needing in your life; and to discover if the Yoga’licious Way is the path that resonates for you–the path that will ignite the fires of transformation in your life. There is absolutely NO obligation to sign up for the program from our call, and if you end up deciding the program is for you I will extend a special discount to you for taking this first, incredibly courageous step. If you’re not quite ready to reach out, that’s okay too. You can click here to learn more about it and begin feeling into the possibilities that will blossom in your life as you realign with your natural rhythms and essential expression. Ps. Stay tuned for the next podcast in the series–Genna shares her experience letting go of people pleaser and perfectionist tendencies to realign with her sacred rhythm and essential expression. For my perfectionists in the house, this one’s a definite listen!